Bhapa doi or mishti doi is a fabulous 5-ingredient Indian dessert resembling cheesecake. 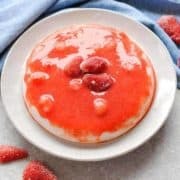 Made with Greek yogurt and a strawberry topping, it is super creamy and healthier than regular cheesecake! When it comes to Bengali desserts, bhapa doi (steamed yogurt) or mishti doi as it is also called (sweetened yogurt) is right up there in my all time favourites list. But, first, a confession of sorts – this mishti doi recipe is a little different from the way it is made traditionally. In the original recipe, milk is first boiled and reduced to half its quantity and jaggery is dissolved in it. This mixture is allowed to cool down until it is just warm, and fresh curd is stirred in. It is left to set in a warm place for a few hours. Then it is refrigerated and served chilled. I don’t make mishti doi this way. Rather, I make more of an instant mishti doi and use condensed milk instead of jaggery. The berry topping is an innovation too, not really part of the original recipe. If you are a purist and do not believe in tinkering with originals, you might get affronted at this fusion of two cultures: traditional Indian sweet meets American cheesecake sort of thing. But, in my book, if it works, it’s good. And it does work! In this post, I share with you two ways of making mishti doi – in the instant pot and in the oven. The first is steamed and the second is baked. 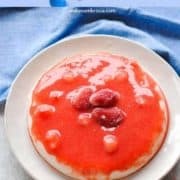 It is delicious – the yogurt has a very creamy texture and the fresh strawberry glaze complements it perfectly. It is very easy to make – made with just 5 ingredients in the instant pot or oven, it comes together in a snap. No special expertise required. It is healthy – comparatively speaking, that is. The cream cheese is swapped with yogurt, a healthier alternative any day. Plus all those uncooked strawberries. Strictly speaking, only the first 3 ingredients are required. 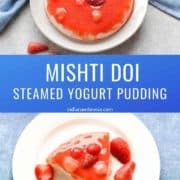 The strawberry glaze is not absolutely necessary if you are looking to make this easy mishti doi recipe even easier. Sometimes, when I’m in the mood for a dead simple, no fuss sweet dish, I just go for the plain version, without any topping. Take the yogurt, condensed milk and fresh milk in a Pyrex bowl that will fit inside your instant pot and whisk with a fork. 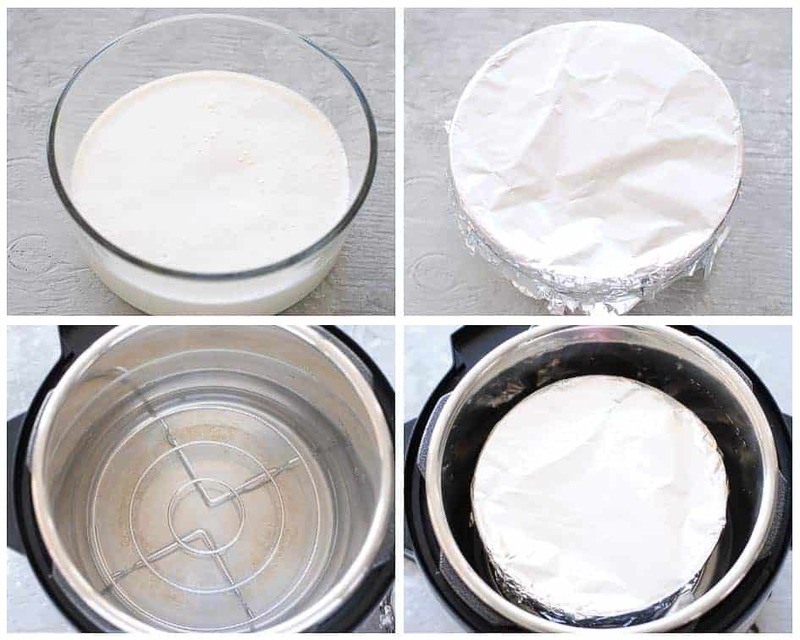 Cover the bowl with aluminum foil. Fill the inner liner of the instant pot with 2 cups water. Place a trivet inside it and keep the Pyrex bowl on the trivet. Secure the lid, close the pressure valve and press the manual or pressure cooking button. Set the timer to 15 minutes. Once the timer has gone, release pressure naturally and take out the bowl carefully. Let it cool down a bit and then keep in the fridge for a couple of hours. I used frozen strawberries in this recipe but fresh strawberries, if they are in season, work beautifully too. 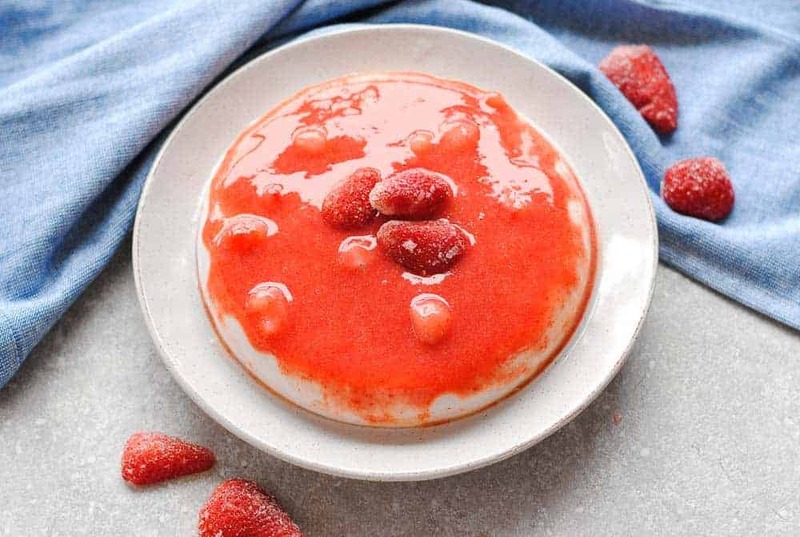 While the cheesecake is steaming away in the instant pot, put the strawberries in a blender along with 2 tablespoons sugar and blend to a smooth puree. Your berry topping is ready. Note: You can use mixed berries like blackberries, blueberries and raspberries too for making the topping, not just strawberries. I like the bright red colour of strawberries, so that’s what I have here. Take the pudding out of the fridge and turn onto a shallow and wide plate. Don’t worry, it will come out very easily since there is a bit of whey from the yogurt which doesn’t allow the pudding to stick to the dish. Drain the whey by tilting the plate carefully into the sink. Spread the berry glaze on top and garnish with a few extra strawberries. Your mishti doi is ready to be served. Don’t have an instant pot? No worries, you can make this Indian cheesecake in the oven too. Baked yogurt turns out exactly the same as steamed. There is no difference in the taste. Take the yogurt, condensed milk and fresh milk in a baking dish and whisk lightly with a fork. Preheat the oven to 350 degrees and place the dish in the middle rack. Bake for 45 minutes. Remove the dish from the oven and let it cool down a bit. Steps 3 and 4 are exactly the same as in the instant pot version. Use full fat Greek yogurt and whole, fresh milk, not low-fat. Don’t add any water to the strawberry topping while blending it. A diluted and watery berry topping is no fun. Don’t be tempted to release the pressure manually if using the instant pot, or the bhapa doi will be wobbly and won’t set properly. Give the pudding a couple of hours at least in the fridge, more if possible. The colder the pudding gets, the better it will set and the tastier it will be. 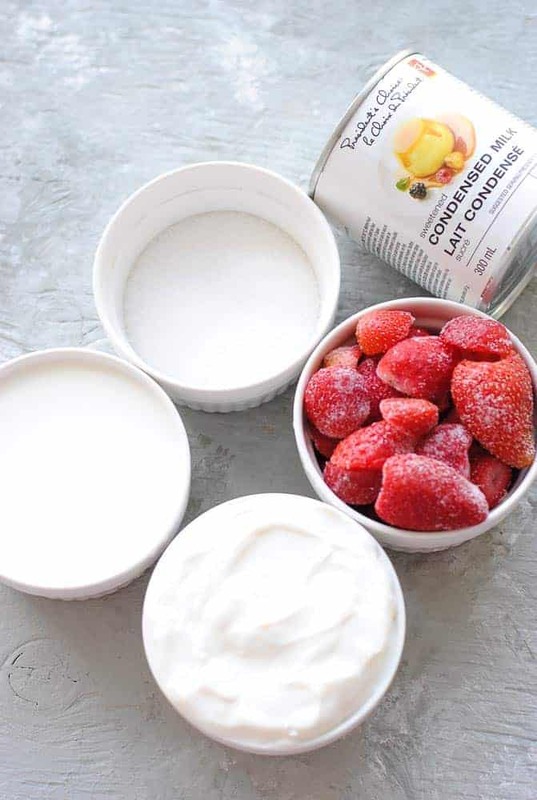 Put the strawberries along with the sugar in a blender and blend to a smooth puree. Keep it aside. Whisk together the Greek yogurt, condensed milk and fresh milk in a Pyrex bowl that will fit inside your instant pot. Cover it with aluminum foil. Pour 2 cups water in the inner liner, place a trivet and put the bowl of yogurt on it. Lock down the lid, close the pressure valve and set the cooker to manual or pressure cooking mode. Set the timer to 15 minutes. Wait for natural release of pressure (NPR) once the timer has gone. Remove the bowl from the cooker carefully and let it cool down a bit. Keep the bowl in the refrigerator for two hours or more. Once cold, take it out and turn over the dessert in a shallow and wide plate. 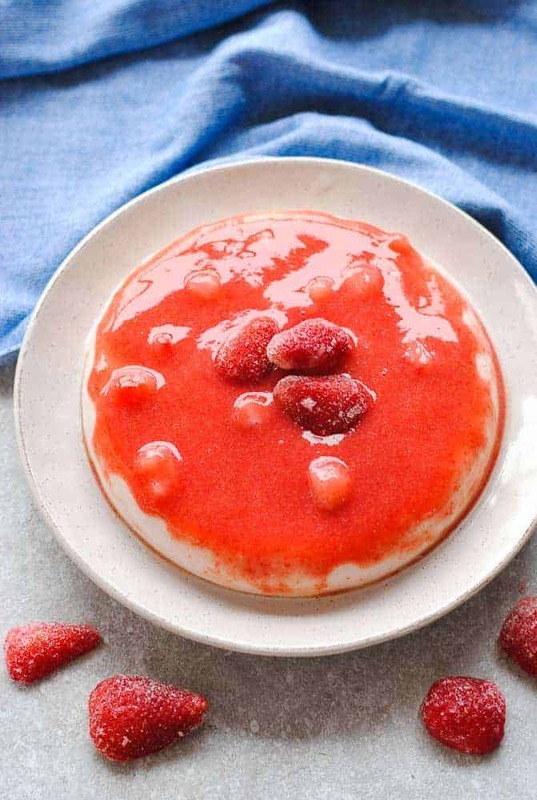 Spread the berry glaze on the mishti doi and garnish with two or three strawberries. Serve chilled. Whisk together the Greek yogurt, condensed milk and fresh milk in a baking dish. Preheat oven to 350 degrees Fahrenheit and place the baking dish in the middle rack. Bake for 45 minutes. Remove from oven and let the mishti doi cool down. Keep the dish in the refrigerator for a couple of hours or more. Once chilled, take the mishti doi out of the fridge and spread the berry glaze on top. Garnish with a few strawberries. Substitute the strawberries with berries of your choice or a mix of several berries – blueberries, blackberries or blueberries. Wow, this looks so much like cheesecake, but with much healthier ingredients list. And it only needs 3 ingredients. I’m totally sold! I can’t believe how simple this is, I already have all of the ingredients in the cupboard! It looks delicious, I will have to make it this weekend. This bhapa doi looks absolutely delicious. 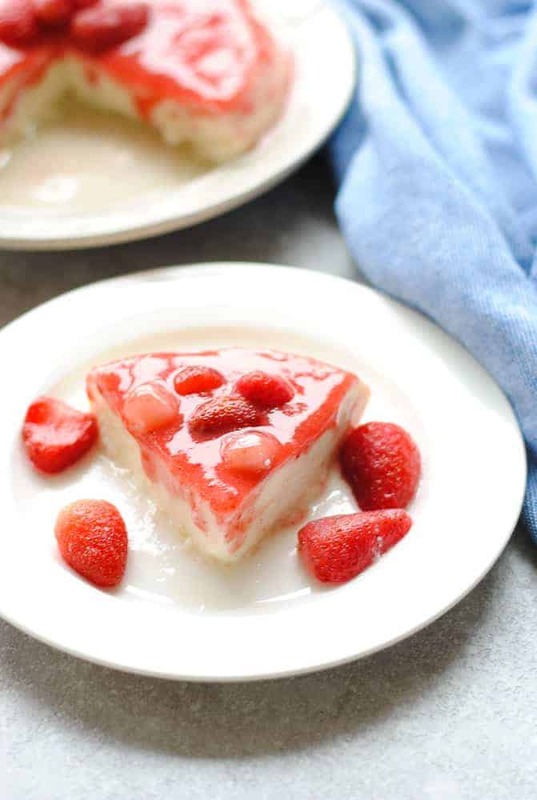 I love that I can make this in my instant pot for an effortless dessert perfect for any day of the week. Oh my goodness, this Indian cheesecake is fabulous. Great use for my Instant Pot. 🙂 It will be on our table often. This sounds and looks really delicious. Love the addition of raspberries. I must give this a try very soon. I’m such a huge fan of anything cheesecake like. I have never tried this, but boy it looks delicious. I have not made yogurt, but I think I need to give this a try. I would have a hard time not eating this for breakfast. I’ve been obsessed with cheesecake lately but have shied away because it’s not exactly on my latest diet plan. Your Bhapa Doi is such a fresh and delicious looking alternative and the best part for me is it can be made in my instant pot! Thanks so much for sharing this fascinating sweet treat with all of us. 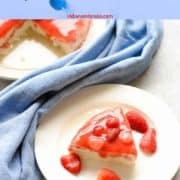 I’ve never seen this recipe before, it looks like a great alternative to the classic cheesecake! Look forward to trying this out! This looks delicious and incredibly satisfying! I will have to try it soon. Wow this sounds (and looks) phenomenal! So easy and one that I cannot wait to make! I have all the ingredients on hand so this will be made in the near future! Thank you for sharing! Yum! this looks delicious, I love all of those berries and that it’s made with yogurt instead of cream cheese! This is unlike anything I have ever hear of before , but I know now that I NEED it. And I already have all the ingredients to make it . Just when I thought I’d exhausted all of my instant pot’s uses! This looks so interesting and so yummy! I’m a HUGE cheesecake fan, and I love how similar, yet unique this recipe is — especially with all those yummy berries on top!! Thanks for the Instant Pot instructions! Really excited to give this recipe a try! Love cheesecake, so know I’ll love this! This sounds amazing! I don’t like cream cheese in desserts but I love yogurt – I can’t wait to give this a try as an alternate to cheesecake! This looks like a simple and easy dessert. I really need to get an Instapot. Such a refreshing dessert. Love the twist to the classic dessert with strawberries. Looks amazing and so perfect for summer!